Enhance the charm of youth... the beauty of youth can best be emphasized by furs. 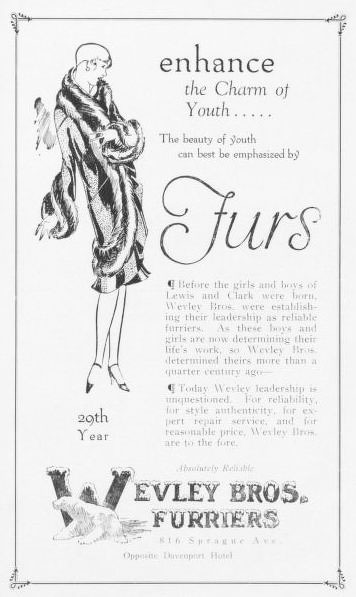 Before the girls and boys of Lewis and Clark were born, Wevley Bros were establishing their leadership as reliable furriers. As these boys and girls are now determining their life's work, so Wevley Bros determined theirs more than a quarter century ago. Today Wevley leadership is unquestioned. For reliability, for style, authenticity, for expert repair service, and for reasonable price, Wevley Bros are to the fore. Always reliable. Opposite Davenport Hotel.